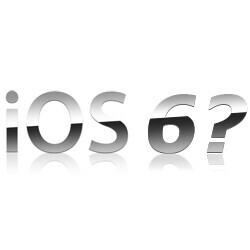 Is iOS 6 already on a few trusted iPads locked deep away somewhere within the Cupertino fort? If the information found in some recent server logs is any indication, then it may very well be possible. ARS Technica recently took at look at its monthly browser logs and found some interesting device information. First of all, they found 346 visits from iPads with a screen resolution of 2048 x 1536, which coincides with the rumored retina display resolution and other reports of analytical data showing a device named “iPad HD” with that resolution. Additionally, there were iPad user agents from Apple’s corporate IP block that were running iOS 5.0.1, iOS 5.1, and, most interestingly, iOS 6. The iOS 6 devices were also running a newer build of WebKit. It is pretty doubtful that Apple’s March event will include an iOS 6 announcement, especially considering that iOS 5.1 hasn’t been released to the public yet. It would make sense, though, that iOS 6 would be in its infancy and may be planned for the fall when the next generation of iPhone is rumored to be announced. These thum downs your getting are nothing but haters. I see these obsolete remarks frequently. Why do you call it obsolete? It's like apple has done something evil to them. ZOMG IOS 6?! shut up and take my money!!! its just a moniker… not something to get offended about… retina is pretty much known to be above the ppi that the human eye can detect from a logical distance.. which the iphone/rezound/other screens achieve… i mean why not get offended about nokia clearblack? super amoled plus? nova? Because Super Amoled is real "different and unique" tech, it replaces the regular 2 subpixels with 3 subpixels. Clearblack is regular Amoled with a filter on top, also unique and different. And Nova is less power hungry. Retina is just a clearer screen because of high ppi, which any other company can easily make (ThinkPad, etc) with no new or different technology, why does it get it's own name? yup, definitely right on that one. apple's just dumb to make up something which can be done by everyone else. you are a moniker. lol give it up, there is just no talking to some people. i have no position on this article. ios 6 is imminent, i dont need 5 articles a week remiding me that the number after 5 is 6. i was just having fun with you.